Launched in 2012 in celebration of the 50th anniversary of the Leonard & Bina Ellen Art Gallery’s Permanent Collection, the SIGHTINGS satellite exhibition program was conceived as an experimental platform to critically reflect upon the possibilities and limitations of the modernist “white cube.” As part of this program, artists and curators are invited to develop projects for a cubic display unit located in a public space at the university, with the aim of generating new strategies for art dissemination. Since 2015, programming for SIGHTINGS has explored an annual thematic—work/labor, pedagogy, and psychopathologies—that re-examines the exhibition display’s formal, conceptual, historical and contextual parameters in light of current sociocultural issues. Focusing on the notion of systems, the 2018-2019 edition addresses how the systematicity of the art world corresponds with that of the real world as considered in its various dimensions (political, social, and economic, among others). Accordingly, this cycle of projects continues the critique of the white cube as a “closed system” at the origin of SIGHTINGS and revisits the legacy of conceptualism by drawing attention to power dynamics, contradictions and flaws inherent to these systems. The SIGHTINGS program is developed by Katrie Chagnon. SIGHTINGS is located on the ground floor of the Hall Building at 1455 De Maisonneuve Blvd. West and is accessible weekdays and weekends from 7 am to 11 pm. 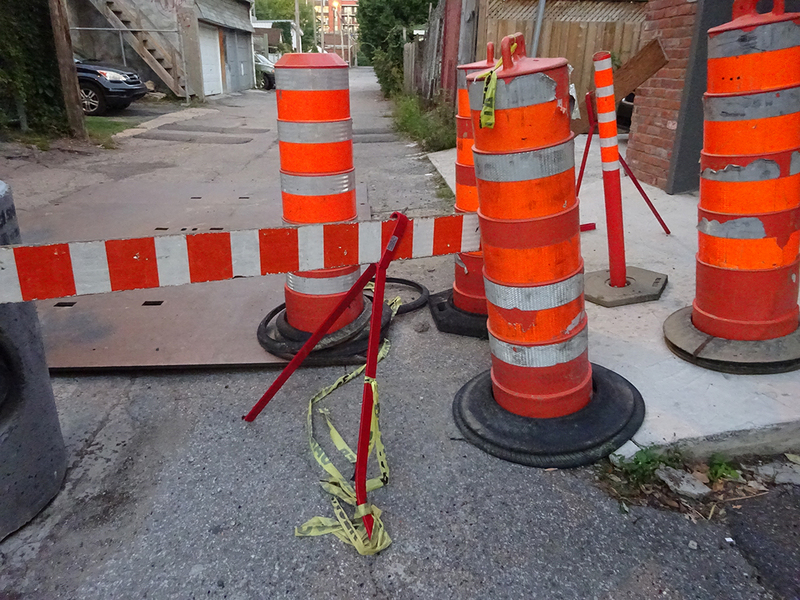 During the construction holiday, the city of Montreal goes silent. The last two weeks of July are a relief. No jackhammers or that signature backup beep-beep-beep of trucks reversing. When the reprieve ends, it’s back to a video game of cars and bikes swerving, detour signs pointing down blocked alleys, and roads ending without warning. I have no sense of direction or orientation when I move through a landscape. What I can differentiate is scale. A is half the size of B; C and D are as far apart as E. I then often forget Y but that’s fine. I’m sure my rapport with scale is part of why I like large-scale sculpture. I like to call it “big breath art” — it gets in my lungs and expands and slows me down, softly, like a weighted blanket. I’m wary of scale too. As a sculptor, so much of what I am trained in constructs and destroys in its process of creation. Think of all the garbage that artists put into the world. That big breath feeling continues to be harnessed for state propaganda, to overwhelm and subdue. My mornings often begin with my phone alarm ringing after the traffic of St-Denis Street wakes me up. Both feel gross. But @fucknomtl on Instagram makes me laugh out loud and spit-take my coffee onto my screen. This Montreal-based account visually chronicles small-scale urban failure, with an ongoing punchline of Montreal as erratic and decomposing through impotent construction. It’s the tragedy/comedy line perfected. Montreal construction corruption is its own phenomenon, but I want to step outside the realm of municipal politics and keep going. 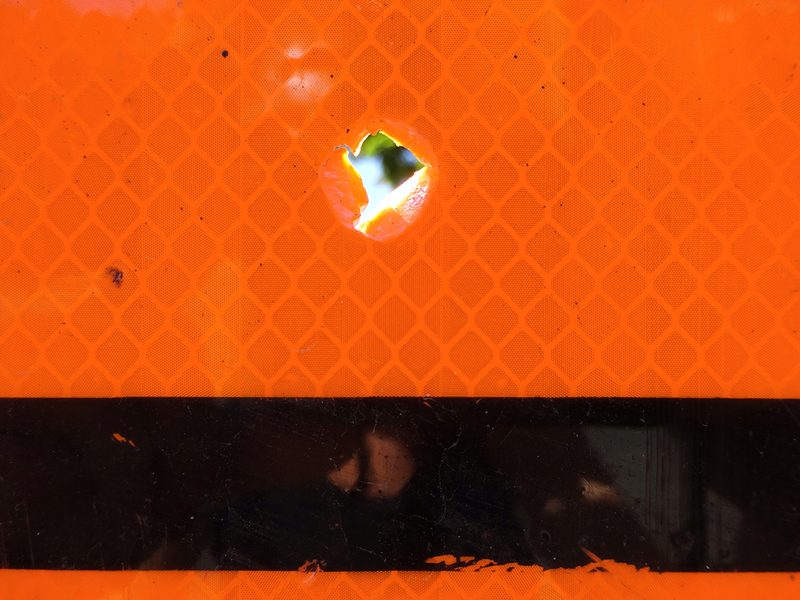 I see the construction orange as stained glass. A hue cast over the city from the church above, below, sideways, and inside. Reflective and glass but also made of waterproof material that goes swish. Wikipedia says safety orange is meant to contrast the azure of the sky. As I am writing a new immigration detention centre is being built in Laval, a bigger institution to replace the current one which is falling apart. Jacques Laplante, Prison et ordre social au Québec (Ottawa: Les Presses de l’Université d’Ottawa, 1989), 44. “Life in Prison: Building Prisons,” The Virtual Museum of Canada, 2009, accessed March 26, 2017, http://www.culturepop.qc.ca/prison/en/building-prisons.php. Laplante, Prison et ordre social au Québec, 59 [Free translation]. “Anti-Construction Crew Releases Thousands of Crickets into Immigration Prison Architecture Headquarters,” Montreal Counter-Information, April 18, 2018, https://mtlcounterinfo.org/anti-construction-crew-releases-thousands-of-crickets-into-immigration-prison-architecture-headquarters/. Claire Culhane, Barred from Prison: A Personal Account (Vancouver: Pulp Press, 1979). Angela Y. Davis, Are Prisons Obsolete? (New York: Seven Stories Press, 2003). 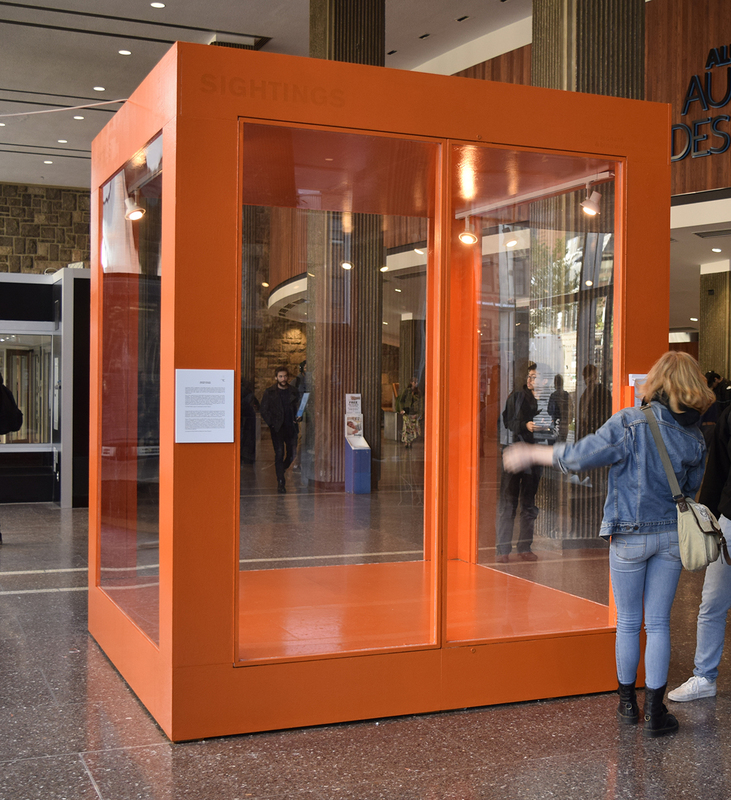 In conjunction with Sheena Hoszko’s exhibition Safety Orange: 2,864,751,589 of these orange cubes fit in the area of Greater Montreal, the Leonard & Bina Ellen Art Gallery is hosting Sculpture and Power, a collective discussion exploring how contemporary sculpture enacts and limits power. 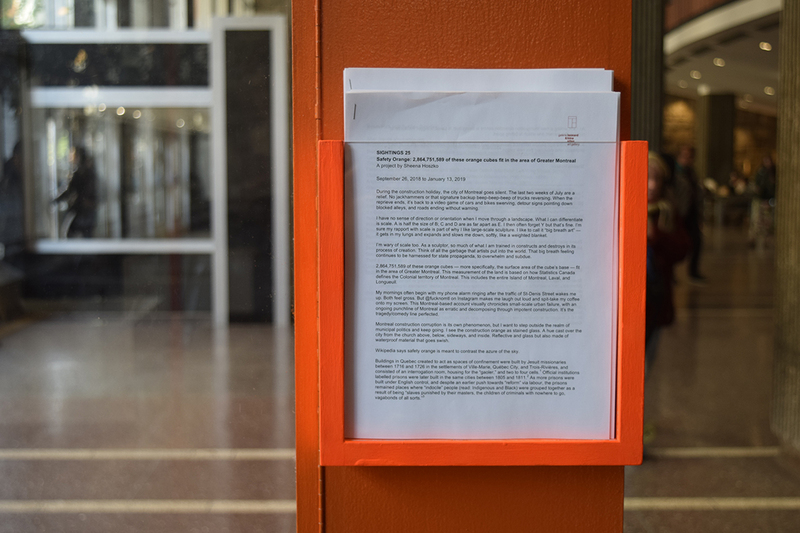 The discussion will center on writings by Anna C. Chave, Yaniya Lee, and Matthew B. Crawford, that participants are encouraged to read prior to the event. The discussion will take place mainly in English. Snacks will be provided to participants. Please register with Robin Simpson to participate. Spots are limited. Anna C. Chave, « Minimalism and the Rhetoric of Power », Arts Magazine, vol. 64, no 5, p. 44-63. Matthew B. Crawford, Shop Class ad Soulcraft: An Inquiry into the Value of Work, New York, Penguin Books, 2009, p. 5. Thank you: Jonathan, Mark, @fucknomtl, Ted, Genevieve, Anna, Kiley, Michelle, Skye, Marie-Michelle, Miranda, Michèle, Katrie, Hugues, Robin, and the Leonard & Bina Ellen Art Gallery. SIGHTINGS is located on unceded Kanien’kehá:ka territory. The prison system is an extension of the colonization of the lands of so-called Quebec and Canada.